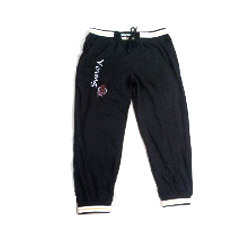 We are a trusted name in engaged in manufacturing and supplying a vast range of Track Pant Lowers. The offered range is tailored using excellent quality fabric that is sourced from most authentic vendors of the market. These lowers are tailored in various finishes, sizes and patterns at minimal rates in accordance with the specifications provided by the customers. Looking for Track Pant Lowers ?